The Scottish Government's parentzone website has published data on the performance of school leavers. The Daily Record highlighted how these figures show a shocking class divide between the wealthiest and least well off areas of Scotland. This is my opinion piece in the Daily Record that ran alongside the article. In it I argue that the difference tells us more about poverty than schools. "These figures don’t tell us much about schools. What they tell us is that poverty ruins lives. The enormous gap in qualifications between children in poor and wealthy areas is simply a reflection of the inequality that scars Scottish society. An appalling number of families are relying on foodbanks. You don’t need to be an educational psychologist to work out that a well fed child is going to be a better pupil than one who is hungry. Saying that looking at these figures tell you more about house prices than it does about standards in schools is no joke, it’s the truth. They certainly don’t tell us much about the teams who deliver education in the schools. Arguably it’s the schools where fewer children are getting qualifications that are working the hardest, as the team in the school attempt to help the children overcome a host of social disadvantages in order to learn. Think about it – if it were simply a matter of the attitudes of the staff would the pattern of poor areas and supposedly poor schools be quite so consistent? One of the things that drives attainment is the chance to undertake educational enhancing activities. It is clear that better off parents have resources to allow their children to take part in a wider range of activities than their less well-off peers. For example, going to see a play live makes it easier to get good marks in English than just reading it in a book or out loud in the class. Those who have the least opportunity to do these activities out of school because of lack of money, need to have these opportunities through school. Cuts in local authority funding, made worse by the council tax freeze, mean that the cost of school trips, whether for a day or a week, and sports clubs are increasingly falling on parents. These are burdens that many families cannot meet. Here in UNISON we have been told by members on low wages or zero hour contracts of instances of their children, knowing the sacrifices their parents would make to find the money, of not even telling parents about school trips. These charges mean that far from narrowing the gap will see it grow. There are some initiatives that could be taken in schools that might make some difference. Ensuring poorer children are not denied support that can't otherwise be offered would be a good place to start - for example by ending the trend of getting rid of Classroom Assistants. And let’s hope that the political response to these figures avoids nonsense about ‘improving aspiration’. As if the poor, who lets remember are mostly working for a living, don’t or can’t care for their children. No one should be in any doubt that the real key to reducing the gap between how children in poor areas do compared to children in rich areas is to reduce the gap between rich and poor." The early closure of Longannet power station in Fife is a shocking blow to the workforce and the Fife economy. The causes are a toxic cocktail of company indifference, absurd regulations and an energy policy that's not fit for purpose. Scottish Power has announced that it is to to close its coal-fired power station at Longannet early next year, rather than the original 2020 date. This comes after they failed to win a contract from National Grid to help maintain voltage capacity on the grid. The company didn't even bid for the earlier capacity auction from 2018. 270 jobs will go, plus those in the supply chain, including freight train operations and Scotland's struggling coal industry will suffer even more. So why is it closing early? Firstly, because of discriminatory transmission charges. The cost of sending electricity down the long distance transmission wires is heavily biased towards encouraging electricity generation near where it's consumed - mainly in the big English cities and London in particular. This is important because Scotland has always been an exporter of electricity, providing quality jobs and contributing revenues to the Scottish economy. This means that if you generate power near London you get a subsidy from the grid. If you generate it in Scotland or the North of England, you pay an additional charge. Ofgem's Project TransmiT has been reviewing those charges for years, but the changes will be too small and too late for Longannet. At best, its transmission costs next year will fall from £40m to £34m. Secondly, we have company indifference. ScottishPower is owned by the Spanish energy giant Iberdrola, who have significant pressures on their limited investment funding. They have failed to invest in Longannet, either to make it IED compliant (reducing emissions) or put in a serious bid for Carbon Capture and Storage (CCS). It suits Iberdrola's purpose to highlight transmission charges because it diverts attention from their own failures. Former energy minister Brian Wilson described the relationship between the company and the Scottish Government in a recent column in the Scotsman. Lots of grand announcements, but precious little delivery. "Now reality is closing in. The Scottish Government’s policy is based on crossing its fingers and hoping that hated nuclear power stations keep going till 2030. Cockenzie is closed. Longannet is on the way out. "Renewables" has turned out to be synonymous with onshore wind – with virtually none of the hardware which adorns our hillsides manufactured in Scotland." We now have the previously unthinkable situation where Scotland relies on England to keep the lights on when the wind isn't blowing. As Tom Greatrex MP highlighted recently, in the three years from 2012 to 2015, Scotland relied on English power for part of 231 out of 1036 days, or one in five. For seven days in each year, Scotland imported electricity from England for a full 24 hour period. Even with English electricity there will be a concern that we have enough generation capacity in Scotland. On Boxing Day, when wind generated less than 1% of the power from Scotland going into the grid, Longannet met 40% of our electricity demand through coal. When our two nuclear stations go as well, the position will be even worse. The early closure of Longannet is the result of an energy market that isn't working for Scotland. Multi-national companies don't care where the power is generated, but we should because of the impact on jobs and the economy. Equally, governments need to recognise the value of a balanced energy policy that ensures a mix of generation capacity. That is the best guarantee that the industry in Scotland has of a long term future and importantly, our lights remain on. Today is UN World Water Day. It’s a day to celebrate water. It’s a day to make a difference for people across the world who suffer from water related issues. It’s a day to prepare for how we manage water in the future. In a developed country like Scotland we take water from the tap and the disposal of wastewater for granted. In developing nations the responsibility for collecting water every day falls disproportionately on women and girls. On average women in these regions spend 25% of their day collecting water for their families. This is time not spent earning an income, caring for family or attending school. 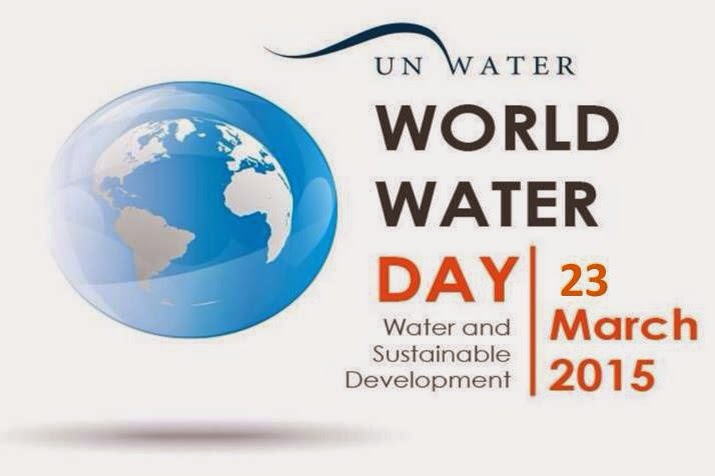 This year, World Water Day is focusing on sustainable development. Climate change negatively impacts fresh water sources. Current projections show that freshwater-related risks rise significantly with increasing greenhouse gas emissions, exacerbating competition for water among all uses and users and the potential for conflict. Combined with increased demands for water, this will create huge challenges for water resources management. Here is just one of many scary statistics about water. To produce two steaks you nee 15,000 litres of water. By 2050, agriculture will need to produce 60% more food globally, and 100% more in developing countries. In Europe a year has passed since the so-called 'positive' response from the European Commission to the first successful European Citizens' Initiative (ECI), but there has been little action. Nearly two million citizens who supported the Initiative are waiting for the European Commission to implement the Human Right to Water in the EU, and to stop its water commodification and privatisation agenda. The European Parliament is debating its opinion about the Initiative and the human right to water, which will be voted in the Plenary in July this year. European trade unions and others will be demonstrating in Brussels on Monday to call upon the EU to take action. In Scotland, we are very fortunate to have a public water service. Scottish Water has around 5 million customers in 2.45 million households. 1.3 billion litres of water is provided every day and 842 million litres of waste water is taken away and treated before being returned to the rivers and seas. It has to cover an area of over 30,000 square miles, a third of the area of Britain. And Scotland has a longer coastline - over 6,800 miles - with a small and relatively dispersed population which requires a large number of small water and waste water treatment works. Despite these unique challenges, we pay lower charges than the average for the privatised industry in England. That's what public service can achieve through lower borrowing costs, vital to a capital intensive industry, and of course no profits filtered off to shareholders. Across Europe, towns and cities are taking back their water services from the big corporations, recognising as we do the benefits of public ownership. However, we can't afford any complacency. The sharks would love to get their hands on Scottish Water. There remains an active lobby to privatise Scottish Water, even if they try and hide behind Trojan horses like Public Interest Companies or cooperatives. Scottish Water has already privatised almost all of its capital programme and the Scottish Government is considering handing over the contract for public sector water to an English private water company. The direct consequence of the absurd introduction of competition for non-domestic services. The regulatory system in Scotland seeks to mirror the English system, designed for a privatised system not a public service. Scarce resources are wasted maintaining these arrangements that do nothing for service delivery and encourage short term cost cutting that could put safety at risk. In 2012 the Scottish Government launched a positive initiative - Hydro Nation. It set out a vision for Scotland's water that recognised a wet country has amazing potential in a world where water will increasingly be a scare resource. Sadly, the initiative was watered down (intentional pun!) and the grand vision has not been realised. The idea was right, even if the delivery has been poor. Scotland needs a more democratically accountable water structure. One that builds on the public service ethos and takes full advantage of one of Scotland's greatest assets. On World Water Day let's be thankful we have a high quality public water service, but also recognise that we can do better. 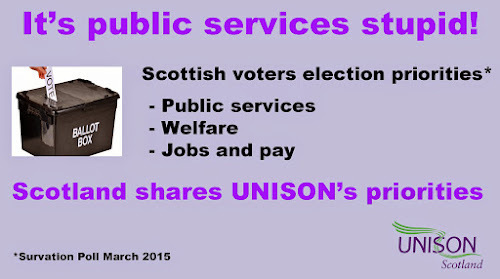 Public services are the number one election issue for the majority of Scottish voters. Today we have published a full scale poll undertaken by Survation, for UNISON Scotland, that asked Scottish voters to explain their priorities. They said that public services, welfare, jobs and pay were the most important issues for them in the coming general election. They were also clear about their spending priorities.If the next government was to raise £2bn by cracking down on tax avoidance, 58% of respondents believe that the money should be spent on improving public services, compared to 19% who think it should be spent on reducing public borrowing, and 17% who think that it should be used on income tax cuts. This is the complete opposite to George Osborne’s Budget priorities this week as I set out last night. It is clear today that while yesterday's announcement might have brought the average cuts down over the spending review period, it still means around £2bn of Barnett consequential cuts for the Scottish Budget. That is around 30,000 further public service job losses in Scotland. Scottish voters also had clear views about who should deliver public services. 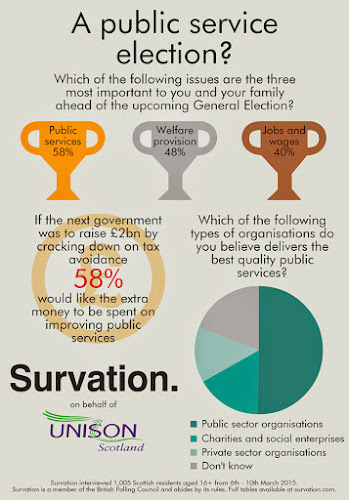 Half of respondents believe that ‘public sector organisations (such as local councils and the NHS)’ deliver the best quality public services. This compares to only 16% who believe that ‘charities and social enterprises (such as co-operatives)’ and 14% who believe ‘private sector organisations (such as businesses)’ deliver the best quality public services. Public accountability was an important factor with more than two thirds saying public bodies are accountable to the public. If a greater proportion of council services was funded locally through council tax and business rates, 44% believe that those services would become more locally accountable to the needs of residents, compared to 12% who believe those services would become less locally accountable to the needs of residents. Scottish voters also agree with UNISON that if acompany wins a government-funded contract it should have to pay the living wage. This poll shows that Scottish voters understand that public services not only support our most vulnerable people, they help grow the economy and contribute to ending poverty and low pay. This is something theUK ConDem coalition is ignoring with their dogged adherence to austerity economics. If you are going to tell porkies, tell big ones. 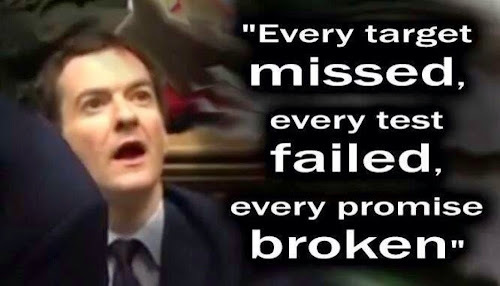 That seemed to be the Chancellor's strategy in today's budget. It was as if the past five years didn't happen. The worst fall in real earnings in recorded history a total fall of 7.9% and even this is on the basis of the lower CPI index. No other real earnings decline comes close. The IFS says his tax and benefit changes since 2010, including the big VAT rise, have cost families on average £1,127 a year. Nearer £2000 if you are a public service worker suffering from the UK and Scottish government pay policy. On public spending the head of the National Audit Office has said that the cuts in public expenditure over the last five years have been too much too fast. The consensus among economists is that low wages and spending cuts have stunted GDP growth, resulting in the slowest recovery from recession on record. This extract from today's OBR report explains, in an international context, why austerity economics have miserably failed. On an individual basis the budget does little for most workers. Increasing personal allowances is the least effective way to help the lowest paid workers and will benefit most those in the top half of the income distribution. Measures to incentivise saving simply won’t do much for those for whom saving is a dream. 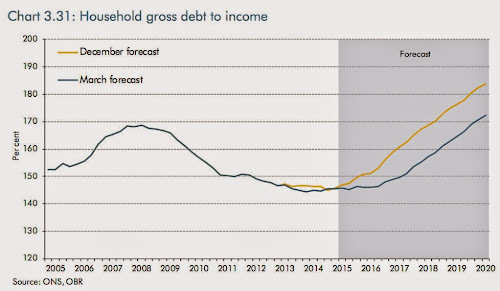 In any case Osborne is still relying on increasing household debt to boost the economy. This chart is slightly less scary than it was last December, but it should frighten anyone who remembers one of the causes of the financial crash. Giving people the ‘freedom’ to turn their annuities into lump sums is a charter for the kind of abuses that have characterised the UK financial services for the past three decades and risks a return to the misselling scandals of the Thatcher era. The Chancellor has been repeatedly warned that the advice structures are inadequate. For UNISON members the most important section in the budget is the changes to public spending first announced in last December's Autumn Statement. Lower inflation gave the Chancellor the opportunity to take the sting out of the IFS analysis that this would take spending back to 1930's levels. "The real cut in public services spending planned for the coming year is slightly smaller than the likely average for the current Parliament. But the squeeze then becomes much more severe than anything we have seen to date in 2016-17 and 2017-18". This chart shows just how bad and it comes on top of his 2016 National Insurance contribution increase that will hit workers and employers alike. The much talked about spending relaxation is in the final year. Of course that is a long way off and based on this Chancellor’s record you wouldn't bet your declining pay packet on him getting there. Not to mention deficit reduction which is based on hugely optimistic growth forecasts. Sadly, every single OBR forecast on deficit reduction and most on growth have been wrong and in every case have been far too optimistic. Particularly when he is relying on extra revenue from tax avoidance. Here his record is dire. The gap between what is owed and what is collected is up not down. There has been no action on tax havens despite the Prime Minister’s promises. In fact he appointed the Chairman of tax dodging HSBC as a Minister. No action on hedge funds, when stamp duty avoidance is costing well over £1 billion a year. Why, because they bankroll the Tory party. As Ed Miliband put it, the Tories are the political wing of the tax avoidance industry. Tax avoidance expert Richard Murphy's view of the prospects of additional revenue: "without tax returns from millions of people and with the HMRC cuts already in progress that’s just plain fantasy." What does this mean for spending in Scotland? As always it is difficult to be precise because we don't know exactly where the cuts will be made in England and therefore the Barnett consequentials. The Chancellor claims that £13bn will come from departmental budgets and £12bn will come from welfare cuts. The £5bn balance from his fantasy tax avoidance savings. The Scottish Government estimates that this means "another £12bn of cumulative cuts in real terms over the period to 2019". A singularly unclear way of putting it because it doesn't tell us the time frame or if it's the annual DEL reduction or some other spending impact. Hopefully, the more reliable IFS will provide some greater clarity tomorrow. 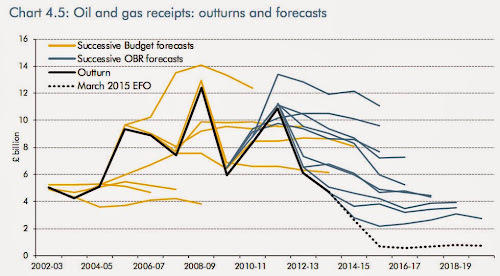 On the subject of Scottish Government economic analysis, if after the GERS report there is anyone who still thinks oil revenues make a good devolved tax, have a look at this chart on oil forecasts. A bad hair day at best! 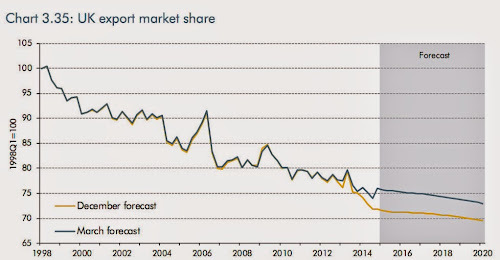 As for the Scottish Government claim that we can plug the gap with a 50% increase in exports, this chart would suggest that remains, as Brian Ashcroft puts it, 'fanciful'. In conclusion, for individuals the budget measures are poorly targeted and will do little to support balanced sustainable growth. The precise consequences for public services and jobs in Scotland may still be unclear, but it will be grim. The annual publication Government Expenditure and Revenue Scotland (Gers) has brought the debate over the merits of Full Fiscal Autonomy (FFA) or Devo-Max into sharp focus. The report shows that in 2013/14, people in Scotland paid £400 more in tax than the UK as a whole but they also received £1,200 more in spending. The revenue figures include taxation from the oil and gas industry in Scottish waters. However, these figures have a time lag and therefore don’t include the most recent fall in oil revenues. Lost revenues now total around £6 billion compared to the figures in the Scottish Government’s November 2013 White Paper. By sheer coincidence, the amount the ConDem coalition has cut from the Scottish budget since introducing austerity economics is also £6bn. That has resulted in 50,000 public service job losses and huge cuts in the services our communities rely on. Fiscal devolution is always a complex interaction, but Full Fiscal Autonomy was always going to be a high-risk approach. With so many public services and the jobs that go with them at stake, it remains a gamble too far. There are some big changes in pensions next month and they are not all good news. Today I am in Orkney on the latest stage of a pensions tour that has included training up our excellent new generation of pension board members. Talking to members, I always emphasise certain key issues that all members of pension schemes should be concerned about. The first is the benefits payable on retirement and second, what you will pay in contributions towards those benefits. Closely linked to both is how your pension pot is managed, what we call governance. That is something most pension scheme members should take a closer look at. The big change in public sector pension schemes next month is the shift from final salary to career average schemes. This will actually deliver better benefits for most members as the disproportionate gainers from final salary schemes have these benefits more evenly spread. In the NHS scheme contributions are going up, due to a Treasury cash grab, but LGPS members are spared that because we control real funds here in Scotland. However, most members will have to work longer before they can access their pension. The other big change is how the LGPS funds are governed. For the first time there will be meaningful member representation on the eleven boards that manage pension funds in Scotland. There are some big issues to be addressed here, including the huge sums of money poured into fund managers pockets and how the funds are invested. We will also be reviewing if we really need eleven funds in Scotland. Tonight's BBC File on 4 radio programme will look at the way Canada manages its pension funds. It's all a far cry from the British pension scene, where a hundred local government pension funds each run their own affairs separately and pay costly fees to City firms for investment advice. The change I am most concerned about is pension flexibilities. The UK government has passed legislation which allows pension scheme members to cash in their pension as a lump sum rather than take a pension. I accept that something had to be done about poor annuities in Defined Contribution schemes, although it would have been better if they had addressed charges, which can be twice as high in the UK than in The Netherlands. However, that would have involved taking on their City pals and that would never do! The government has now gone one further by allowing those in quality Defined Benefit schemes to also cash in their fund. Although noticeably not in the 'pay as you go' schemes (NHS etc) where they would have to pick up the bill. Members doing this could be faced with a big tax bill and charges from an industry that is preparing to make money out of this 'flexibility'. I know this because I had a phone call last night asking me if I would consider this. Pity the poor call centre salesperson who gets me on pensions! As someone who can recall the last pensions misselling scandal in the Thatcher era, I well remember members coming into my office having lost a fortune over dodgy sales pitches. There are a growing number of organisations warning about this. The Westminster Work and Pensions Committee has warned that savers are at risk of being "ripped off" in a new pensions scandal after George Osborne rushed through these reforms with little thought of the consequences. They have added to calls from the TUC and Which? for the urgent introduction of a drawdown charge cap. The protections against misselling in the legislation are also nowhere near strong enough as Ros Altmann and others have warned. Few people really understand their pensions, but they are hugely important deferred pay. They should not be used by politicians as a short term pre-election fix. There are long term consequences for scheme members and the next generation who will have to pick up the bill for pensioner poverty. It's often said, 'all politicians are the same', well in this UK General Election it simply isn't true, at least for public services and those who deliver them. Today is the pre-election Scottish Labour Party special conference in Edinburgh. I was speaking at the NASUWT fringe meeting on supporting public services. For me, this is the number one issue in the coming election. Unusually before an election, we have costed spending plans from both the parties challenging to make up the next UK government. We also have the benefit of them being analysed by the independent Institute for Fiscal Studies (IFS). While I would have some differences with the Ed Balls approach, these are minor in comparison to the difference in spending plans with the Tories. In the IFS analysis after the Autumn Statement they identified a gap of £43bn. The Barnett consequentials of that depends on where Tories decide to make their cuts. So, while estimates vary the numbers are huge - from £2.7bn at best, to £3.7bn at worst. Put another way, around 25,000 to 35,000 public service job losses. We have just come through longest recession and slowest recovery, primarily because of the spending cuts Osborne implemented in 2010. Instead of learning from past mistakes, the Tories are planning to impose more of same failed medicine. It was therefore very welcome to hear Ed Miliband and Jim Murphy talking about Labour's spending plans and what that would mean for Scotland. Labour does not talk enough about this, leaving the nonsense that Labour is voting for austerity unchallenged. The perceived need to talk up a particular interpretation of economic credibility, all too often drives out Labour's positive anti-austerity message. Some will say, voting SNP will get us a coalition, keeping Ed Balls on an anti-austerity agenda. Actually the SNP 'plan', limited in detail though it is, isn't much different from Labour's. However, the key point is that you can't vote for a coalition - it's not on the ballot paper. Even if you could what would be the price? Losing Trident would be fine - most of the Labour Party don't support replacement anyway. The big problem is, will a coalition depend on accepting the SNP demand for Devo-Max. If we had Devo Max now the Scottish Government would have to find a £6bn cut in public services due to the collapse in oil revenues. Coincidentally, that is exactly same amount as Tory austerity has cut from Scottish budget. That led to 50,000 jobs being cut and most of those in local services. That's because the SNP has not dished out the misery equally. 4 out of 5 job losses have been in councils the only portfolio to suffer a cash cut to its budget. This has the perceived advantage of keeping bad news furthest away from Scottish ministers while they keep hold of little pots for sticking plaster announcements. Add to that the Council Tax freeze, underfunded at same level as 8 years ago. A regressive tax freeze that benefits wealthy households while the vulnerable face rising charges for services. So, this election matters for public services and those who work in them and it matters big. The spending cut numbers are huge and they would have huge consequences for public services and those who deliver them. Even if there was some small positive from a possible coalition, the risk of another Tory government is just too big a risk. We cannot gamble with 30,000 members jobs and the services they deliver. But Labour also needs to up its game. Talking up the differences on public spending, not hiding them. That's why I welcome Ed Miliband's speech today. More please comrade!